14kt Gold open end design chain. This unique 14kt gold chain is a custom made to order chain and can be ordered in 14k yellow, white, or rose gold. Platinum is also available and listed on www.PlatinumOnly.com . Gold chain measures 7.5mm wide and 7.5mm thick. Our price shown is for the 16" length weighing aprox. 76grams. Popular lengths are listed but each is custom made to order. Handsome Gold Piston chain. This rugged design Men's chain weighs about 94.5grams for the 18 inch chain that measures 8.25mm in width. You'll love this stylish hand made, hand polished Piston chain. This gold chain is custom made to order and available in any length. Also can be made in 14k Yellow or Rose gold, 18kt golds, or Platinum. Use our request email link for additional pricing. Stylish Gold Bold Box chain. This 5.75mm bold box chain is beautiful alone or with your large pendant. Secured with a substantial lobster clasp this chain will be a favorite. Our price shown is based on an 18 inch length weighing about 90grams. This chain is custom hand made to order in any length. We've listed sugested popular lengths. Also available in 14k yellow or rose gold, 18kt golds, and Platinum. Gorgeous 14k gold sophisticated curb chain. Curb chain measures 8mm wide and price shown is for the 18" length weighing a substantial 94grams. (gram weight may vary as this is hand made) This chain design is custom hand made and hand polished. Chain able to be made in 14k yellow, white, rose gold also 18kt golds and Platinum. Common lengths are listed but able to make in any length, use our request email for additional pricing. Secured with incredible lobster clasp that blends with the link. Handsome 14k Gold fancy Mariner style chain. 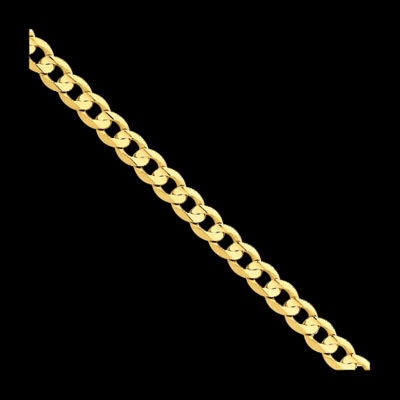 This stylish chain measures 8.75mm wide and our price shown is for the 18 inch length weighing about 78grams. This hand made chain design is custom hand made and we are able to create in any length and a variety of metals including 18k and Platinum. Secured with an incredible quality lobster clasp that blends beautifully with the link. You'll love this custom hand polished chain, it's absolutely gorgeous. Use our special request email for additional pricing on your length. 14k Yellow gold 5.75mm wide beveled curb chain. This chain is part of our "guaranteed for life" collection. If the chain breaks or is damaged for ANY reason simply send it back and we'll replace it!!!! Price shown is for the 20" length weighing about 24grams. Additional lengths also available. Sophisticated Squared Curb design men's chain. This absolutely gorgeous 14k Gold men's chain measures 9mm wide, 20 inches in length, and weighs about 120grams. Because it's made to order we are able to create in any length. Our squared curb design chain is shown in 14k white gold but also can be ordered in 14k yellow, 14k rose, or 18kt gold options. 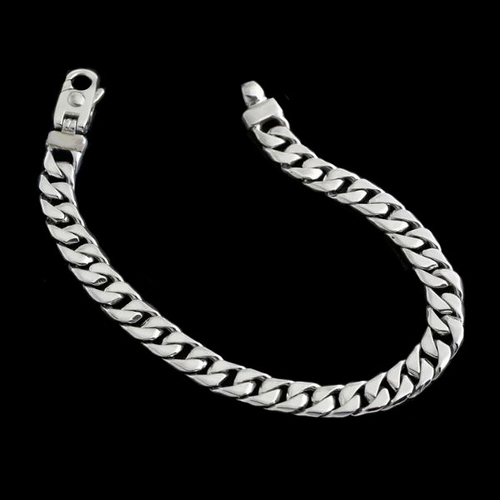 Find the matching bracelet in our men's bracelet category. Secured with a very secure lobster style clasp that blends beautifully with the link. You'll love this custom hand made hand polished chain, it's absolutely gorgeous. Incredible 14k Gold Rounded Curb Chain. This gorgeous chain measures 13mm in width and price shown is for the 20 inch length weighing a heavy 207.38grams. Additional lengths are listed for this chain. Gold chain is secured with a box clasp and safety catch. 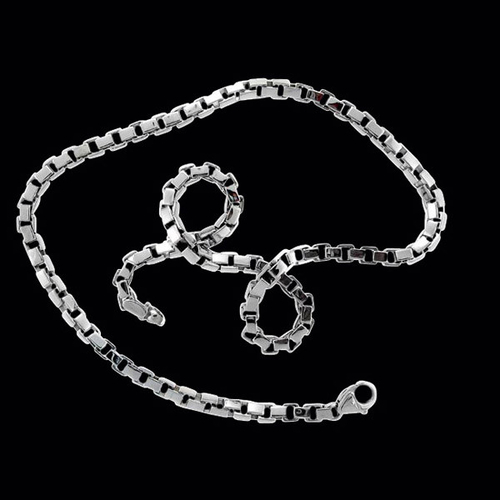 When comparing chains be sure to compare gram weights, this is a very heavy rounded chain. Handsome Gold concave curb design chain. Custom made chain is available in 14k White, 14k Yellow, 14k Rose, and 18kt choices. Email for additional pricing. This incredible chain measures 10mm in width and our price shown is for the 18" length weighing about 127grams. The concave curb is a beautiful hand made to order chain. Handsome Gold concave curb design chain. 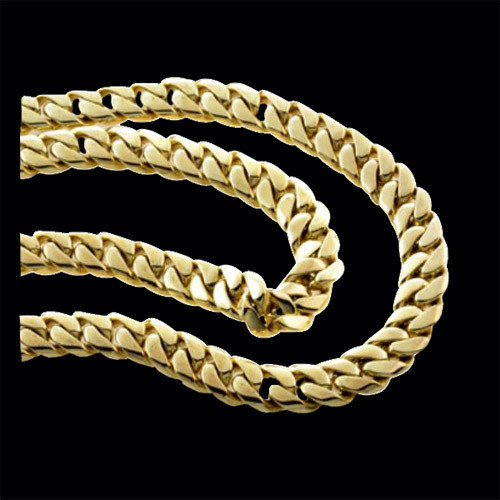 Custom made chain is available in 14k White, 14k Yellow, 14k Rose, and 18kt choices. Email for additional pricing. This incredible chain measures 10mm in width and our price shown is for the 18" length weighing about 147.2grams. The concave curb is a beautiful hand made to order chain. This gold chain makes a bold statement. 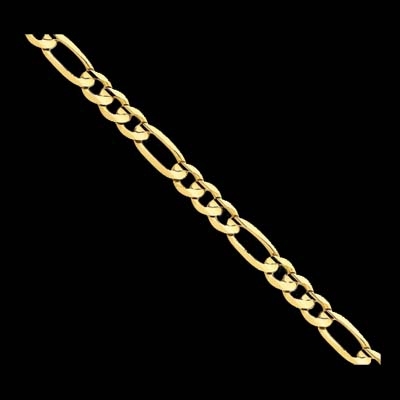 Stunning 14k Yellow gold fancy hand polished chain. This fancy link chain measures 12mm wide and price shown is for the 20 inch length weighing about 146.85grams. Additional lengths available. This gold chain is secured with a box clasp and safety catch. Beautiful 14k Gold Domed Curb chain. You'll love this classic solid domed style curb chain. Very durable and hand polished. This gorgeous chain style is available in a variety of widths and lengths. Custom lengths available, email for pricing. Price shown is for the 4.3mm. Also listed is the larger 5mm wide version. This chain in an 18 inch length weighs about 24.8grams. Very solid polished chain, secured with a lobster clasp. Beautiful 14k Gold Domed Curb chain. You'll love this classic 5.5mm wide solid domed curb chain. Very durable and hand polished. This gorgeous chain style is available in a variety of lengths. Price shown is for the 18 inch length weighing about 35.6 grams. Very solid chain. 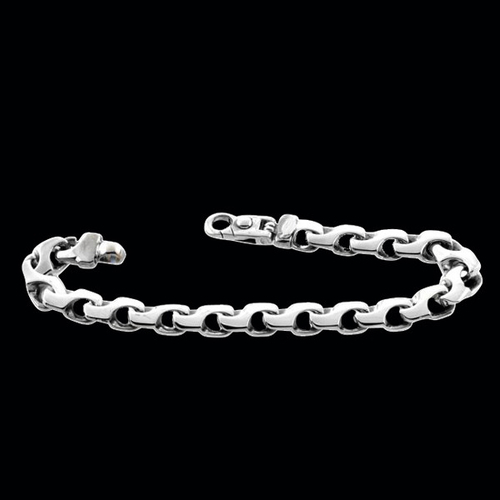 Classic hand polished figaro link chain. This great selection of the classic figaro measures 13mm in width and is available in a 20, 22, or 24 inch chain. Custom order this great figaro design in 14k white gold. Neck chain is secure with a heavy duty box clasp and safety catch. Custom lengths also available, email for pricing. The 20" chain weighs aprox. 189.83grams, 22 inch aprox. 195grams, and the 24" chain is about 227.8 grams. A fabulous chain. Fancy 14k Yellow gold figure "8" design chain. This chain measures 8.75mm in width and weighs about 76.5grams for the 20 inch length. Style is available in 14k White, 18K metals, and Platinum. Use our request for a price quote on your metal choice. A fabulous chain. 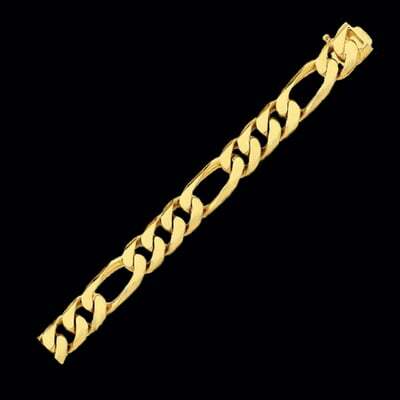 Handsome 14k Yellow gold Hand polished fancy link bracelet. This bracelet measures 10mm wide and is 8 inches in length. 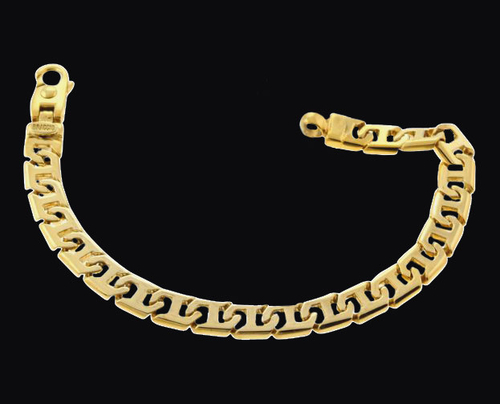 In 14k gold this bracelet weighs about 24grams. Special order this design in 14k White, 14k Rose, or 18K metals. 14k Gold Concave Curb chain. This durable hand polished curb chain is concaved down the center to create it's unique style. Makes a great gift. Price shown for the 3.8mm 16" length weighing about 7.50 grams. Additional widths include a 4.5mm, 5.25mm, and a larger 6.75mm. Available in a large variety of lengths and widths. This solid chain is secured with a lobster claw clasp.